Introducing the all new Rocfish! The International and Oz teams combine to form the new Rocfish super team! It's double the action - double the fun! You won't want to miss their exciting new production of the gospel parable, 'The Prodigal Tale'. Experience the laughter and tears as Rocfish take you on a journey to discover the meaning of true friends and true love! 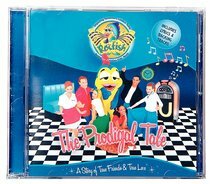 About "The Prodigal Tale (#03 in Rockfish Music Series)"